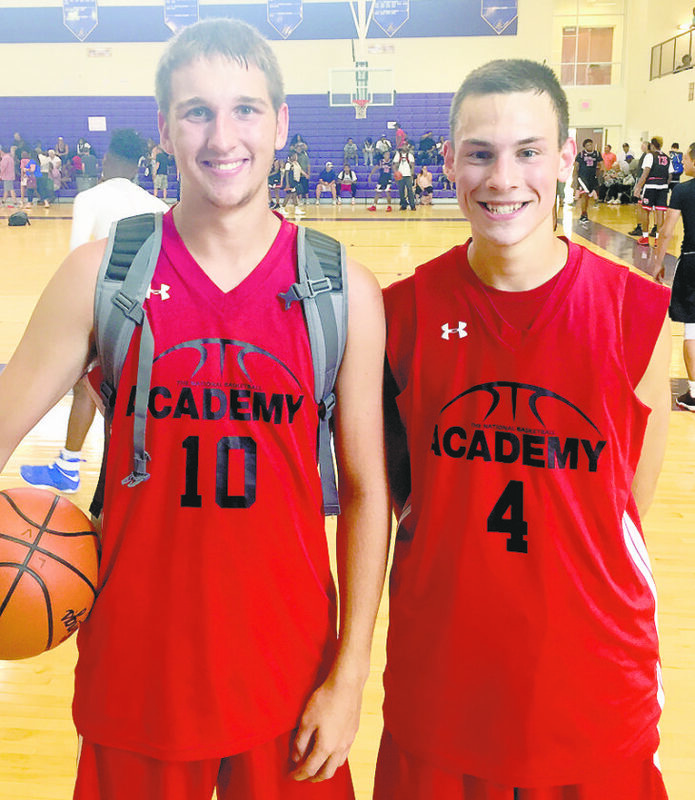 Tribune Chronicle / John Vargo Several LaBrae High School basketball players are improving their games playing on the AAU circuit. Among the Vikings playing in a tournament in the Columbus area this past weekend are Logan Kiser, 10, and Aaron Iler, 4. REYNOLDSBURG — Aaron Iler saw the opening on the baseline, then drove toward the basket — dribbling with his left hand. He elevated as he got in the paint, switched the basketball to his right hand, and the 6-foot-2 senior-to-be at LaBrae High School emphatically slammed the ball during a game Friday while playing for the National Basketball Academy Black 17U team during the Nike Summer Championship at the Summit Campus of Reynoldsburg High School. Is this something we’ll see during the winter when he’s playing with the Vikings, one of the more dominant high school teams in the Mahoning Valley? Iler couldn’t stop smiling as he was asked the question. 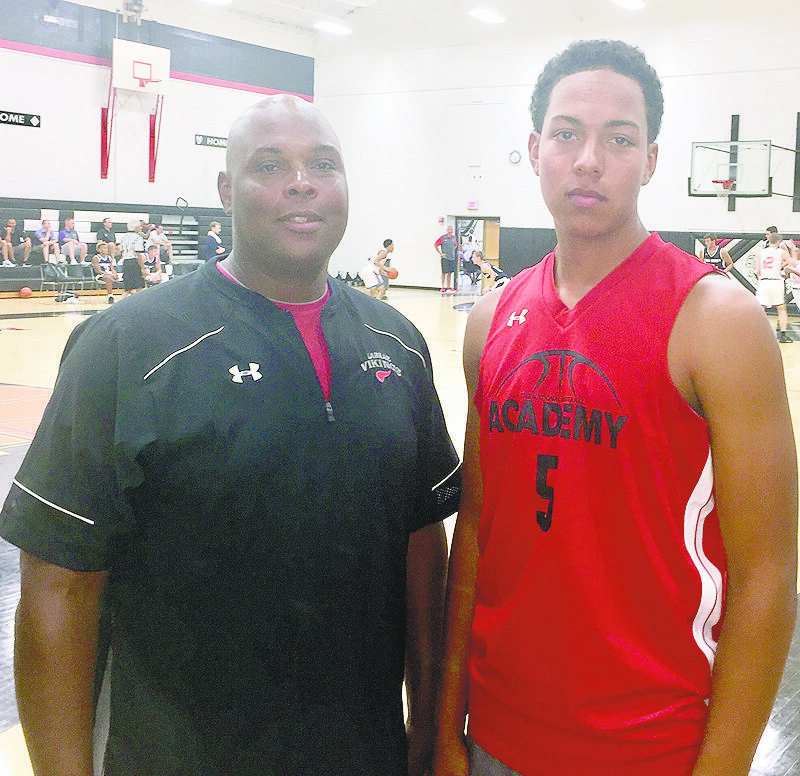 Tribune Chronicle / John Vargo Several LaBrae High School basketball players are improving their games playing on the AAU circuit. Among the Vikings playing in a tournament in the Columbus area this past weekend is Tyler Stephens, 5, pictured with his father, Tony Stephens. Logan Kiser saw his older sister, Mackenzie, play travel basketball and softball while she played for Champion High School. He remembered the times when he asked parents to play catch with him or had one of them rebound while he took shots at halftime of one of her games. Chad Kiser, Logan’s father and LaBrae’s boys basketball head coach, was at the scoreboard for Friday’s game, helping out like most parents do during these contests. He was helping another parent, checking the score every so often, just making sure the numbers were the same on the black rectangular portable electronic board as they were on the lone sheet of white paper where pencil marks showed twos, threes, fouls, timeouts, free throw misses and makes. The purpose of these games are simple, according to Chad, who has seen plenty of games over the years, remembering when Davidson College senior Peyton Aldridge played in AAU games in driving distance of Warren. LaBrae junior-to-be Tyler Stephens is 6-4 and weighs 210 pounds. He plays defensive end and tight end for the Vikings football team. He sat with his family in the auxiliary gymnasium of Whitehall-Yearling High School, about 25 miles west of Reynoldsburg — one of seven gyms used in two facilities for this three-day tournament. Stephens had an epiphany during this past basketball season, one Chad Kiser prior to last season. Originally, the plan was to focus solely on football. Camps at Toledo, Ohio University, Ohio State and Youngstown State took his time. Syracuse has shown interest as well. But Ursuline boys basketball coach and LaBrae graduate Keith Gunther saw some breakout games as the Vikings became one of the better teams in the area. Gunther saw the ability on the court and encouraged Stephens to try out for AAU basketball. He plays for TNBA West Flash 16U. Stephens’ father, Tony, a former football standout at LaBrae, works with Tyler for 3 to 4 hours a day, five days a week to improve his skills and footwork. Tony said doctors project Tyler to grow to 6-8, which would definitely draw some high Division I looks in football and basketball, depending on how his footwork progresses. That seems to be improving, especially in this AAU format. Tony said Tyler had 21 points in a tournament in Van Wert against 6-8 prospects slated to go to Iowa and Wisconsin, places which — if Tyler keeps improving — could be knocking on his door as well. It’s no wonder Tyler has excelled in athletics. It’s in the Stephens bloodline where family members have done well in boxing, basketball, football and baseball. Tony, who is very instrumental in the LaBrae youth sports programs, has seen his son mature and has a basic expectation of him — something most parents would see as a given. There’s no place Iler would rather be than competing on the court. Sure, he could be on his PS4 or hanging out with friends, but this time makes it all worth it to him. He, like other players, are hoping these efforts result in a scholarship. Iler said he hopes he finds a university where he’s having fun and has a tight bond with his team — something he’s shared at LaBrae. Something he’s experienced with the good teammates he’s had in TNBA. “Honestly there’s nothing like the feeling when I’m out here winning a basketball game, scoring, playing defense — playing basketball and having fun,” Iler said.